The Sister Dorothea Penta Music Scholarship is a $500 annual award for eligible music department students. 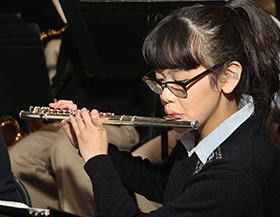 Students must be enrolled in a music-performance class each year at East Catholic, maintain an “A” average in all music classes and a 3.0 GPA overall, and perform at all concerts, festivals, and events required of the group(s) in which they are participating. A video submission (via YouTube, similar website, or email) of you performing the CMEA middle school eastern region audition scales and solos for your instrument/voice. The list of solos and scales may be found at the CMEA website. Please provide the video link in the application below, or email your video to David Brudz. How many years have you been playing your instrument/singing? Have you had the opportunity to perform as a musician outside of a school setting such as in your church or at community events? Please provide a link to your video audition. If it is not online, please email the video to David Brudz and indicate above that it will be sent via email. Upload music teacher/band director’s letter of recommendation. Why you want to participate in the music department at ECHS? What you would like to get out of your experience in HS music?